Cal Poly beach volleyball (23-5) faced two top 15 ranked teams at Pepperdine, Malibu last weekend, defeating No. 12 University of Arizona but losing to No. 2 Pepperdine. After another strong showing against two of the country’s top teams, the Mustangs moved up the AVCA rankings from No. 5 to No. 4, the highest rank in program history. The Mustangs’ day started off with a match against the Wildcats (16-10) as the four victorious duos all earned a win in straight sets. Senior Raeann Greisen and freshman Macy Gordon won 21-13, 21-16 at the No. 4 spot. The No. 3 duo, junior Adlee Van Winden and senior Taylor Nelson, followed with yet another win, finishing with a score of 21-13, 21-17. The No. 1 duo sophomore Torrey Van Winden and freshman Tiadora Miric secured the win for the Mustangs defeating their opponents 21-13, 21-17. The fourth win of the day came from the No. 2 pair of sophomore Emily Sonny and junior Samantha Manley. The Mustangs defeated Pepperdine 3-2 in February, but could not duplicate their past successes last weekend. The Cal Poly No. 1 duo of Torrey Van Winden and Miric took Pepperdine’s No. 1 pair to three sets but fell short losing 21-17, 13-21, 15-12. The Mustangs gave the Waves a run for their money, ultimately losing only by a few points. At the No. 2 spot, Sonny and Manley lost 22-20, 21-16 to their opponents. The loss drops the Mustang’s road record to 6-1. 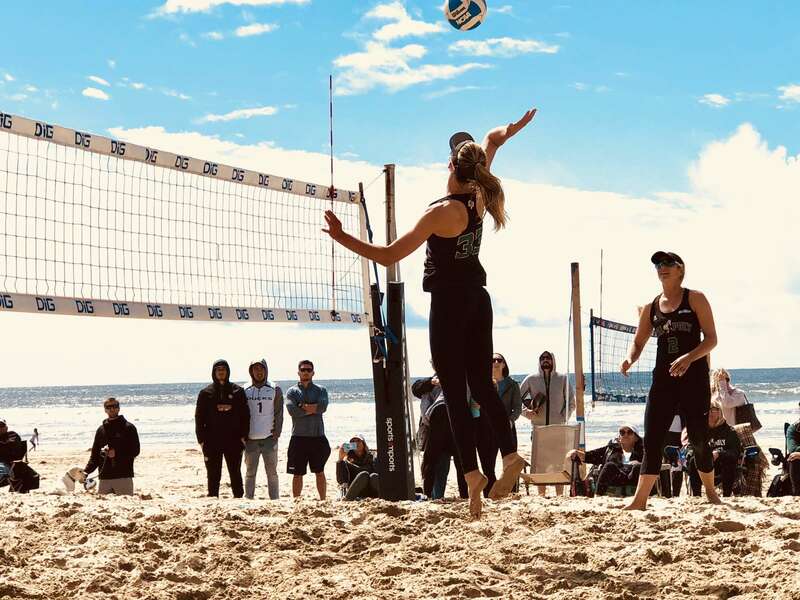 Cal Poly returns to the Central Coast to host Feather River College, Vanguard and San Jose State for their last weekend of regular season play, with the first match set for 8 a.m Friday, April 20 at Pismo Beach.